For new users who just try to install the symbian softwares for themselves.Some users are able to do it easily ,but someone doesn't.Some problems are quite easy to be managed but we just don't know how to do it.For example, after being sucessful for software installation,it needs to be cracked for longer use.Thus there is a cracked file to be installed at specific place;such as E:\system\app\.The problem is when we do the installation, we are unable to see the MMC' s SYSTEM FOLDER. 1. Connect your Card Reader with the computer ,then insert the MMC card to the Card Reader and double click the card to explore it. 2. The problem is when you explore the MMC card ,but you are unable to see the System Folder. Where is it? 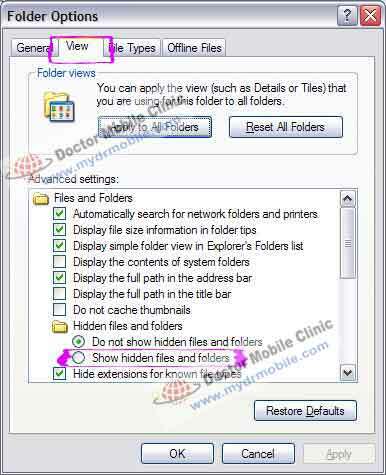 3.Very easy to unhide the system >>>go to menu TOOLS >>>Folder options. 5. 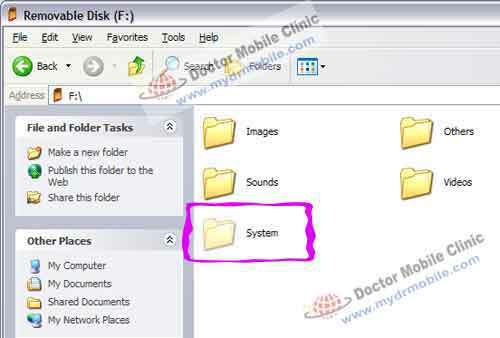 Now you can see the MMC's SYSTEM FOLDER ....well it is just easy.